Imagine if you could control livestock movements without using fences or pressure. According to researcher Dr Dean Revell and NSW sheep producer Bruce Maynard, you can. Dean and Bruce have developed a livestock management strategy called ‘self herding’. It involves allowing animals to become familiar with signals and attractants that can be used as guides to shape their movement through the landscape. “The broad principle is to use attraction and positive feedback rather than exclusion or negative reinforcement,” Dean said. A signal is the first thing that triggers a response because it can motivate the animals to develop a behaviour and, over time, the animals become conditioned to respond to the signals and associate them with a reward. In practice, this may mean that a witches hat or a CD hanging from a pole to catch the sun, or even windchimes, are linked in the animal’s mind with a tasty treat of a mineral lick or salt. An extra special reward, such as molasses, pellets or crushed lupins, paired with a unique signal, such as a whistle, can be used as a jackpot. “We’re not supplementary feeding the livestock,” Dean said. “We’re pulling them into areas where we want them to be and away from areas where we don’t want them to be. “In grazing animals, one of the biggest determinants of what they eat and where they go (in traditional grazing), is what they’ve been eating and where they’ve been going. “Once an area is set up as preferred, then it becomes reinforced as more preferred. It’s like a popular restaurant – being popular is an attractant in itself. Over time, the new grazing behaviour in itself provides a benefit because the animals become more used to going to other areas and they broaden their diet, which Dean said had implications for animal health and productivity. “Self herding is particularly relevant to the rangelands but is also relevant on a smaller scale,” he said. As well as the obvious benefits, self herding improves the relationship between people and animals, with many associated benefits. “The idea is to change how animals respond when people arrive in the area,” Dean said. For more information about these techniques, contact Dr Dean Revell, email: dean@revellscience.com.au; or Bruce Maynard, email: Bruce.maynard@bigpond.com. Alternatively, visit the Self Herding and Self Shepherding website: selfherding.com. This article was originally published in Meat & Livestock Australia’s industry magazine, Feedback (December 2018/January 2019 edition). 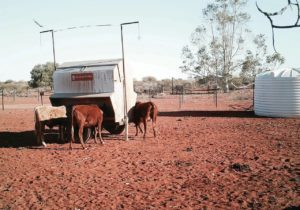 The research organisations involved in this project, ‘Grazing with self herding to improve performance of pastoral cattle’, are: Rangelands NRM, Revell Science, Stress-free stockmanship, Northern Territory Primary Industries and Resources, Territory NRM, Vista Agriculture Services/Oxley Grazing. The funding organisation was MLA, with in-kind contributions from the research organisations.